Up to 450 pounds. daily ice production. Stainless steel exterior with the fit and finish of an appliance. Patented self-cleaning and self-sanitizing technology. New batch water system delivers better ice cube formation. Manitowoc Ice offers the ideal equipment to satisfy any restaurantice making need. With output ranging from 65 to well over 2000 pounds of ice per day, we have a dependable product available for any requirement. There is no need to hide a Manitowoc ice machine. Our award winning Q-Series design, complements any front room application. Your customer is looking for peace and quiet when he or she dines out. We can help you remove nearly 75% of the noise and heat at the point of ice making. Check out Manitowoc's QuietQube® technology. The quietest ice machine in the world. Reduce labor costs and promote food safety with a Manitowoc ice machine.We've reduced the cleaning or sanitizing effort on our ice machine to flipping a switch. All Manitowoc ice machines have our patented technology that cleans or sanitizes the water-distribution system in just 24 minutes…..built-in…at no extra charge. TheManitowoc S-Series Ice Machines are designed to lower energy costs and service cost for restaurants, hotels, convenience stores, and institutions like schools and hospitals Undercounter Ice Machines Compact undercounter ice machines are ideal for small volume ice production, limited ice needs, or as a back up during peak business hours. Production for these air-cooled or water-cooled units range from 147 lbs to 290 lbs of ice regular, dice or half dice cubes in 24 hours. Bin doors slide up and out of the way allowing unobstructed access to the ice bin. These units are perfect when you need ice made on the spot and don't want to carry or haul ice from another location. Why Choose Manitowoc for your business? There is no need to hide a Manitowoc ice machine. The award winning Q-Series design, complements any front room application. Reduce labor costs and promote safety from bacteria build up. 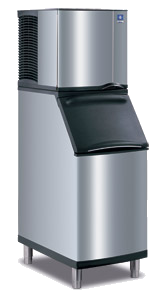 Manitowoc ice makers reduce the cleaning or sanitizing effort on our ice machine to flipping a switch. All Manitowoc ice machines has their patented technology that cleans or sanitizes the water-distribution system in just 24 minutes; Built-In for your convenience. Manitowoc ice machines offer industry leading selection and operation systems. As an ISO 9001 certified company, our commitment to quality is #1. Our unique ”rhomboid” shaped cubes are easy to work with. Ideal for drink and cooling applications in a wide variety of machine options with ice production from 65 to 2000 lbs. per day. Choose from three cube sizes.